Need to clean your coffee maker or Keurig system but don’t want to use vinegar? Maybe you can’t use vinegar for some reason. Read on I will give you the best alternatives to cleaning your coffee maker with vinegar right here. Sometimes you just don’t have or don’t want to use vinegar for cleaning. I get it. Although vinegar is one of the best all-natural and safest household cleaners around a lot of people don’t like to use it because of the potent vinegar small it leaves behind. Probably the most common way to clean the water deposits and coffee oil residue out of the coffee maker and pot is to use regular old household white vinegar. The reason being is it’s relatively high PH or acidity. The average jug of white vinegar that you find at your local grocery store has a ph level around 2.4 with a 5% concentration of acid. The best alternative to using vinegar is lemon juice as it has nearly identical acidity and ph levels. The main difference is the source of acid. Vinegar is acidic due to acetic acid as opposed to the citric acid found in lemon juice. More – Top Alternatives to Cleaning Coffee Makers with Vinegar. On the whole a lemon juice and water cocktail will clean out the inside of your coffee make just as well as a standard vinegar concoction (described here) but it will a lot harder to get enough pure lemon juice out of lemons if you are squeezing them yourself. You could on the other hand buy straight lemon juice but the cost will be a lot higher for the volume of lemon juice you need. Typically you need to run a full coffee pot (12 cups) to fully clean out the insides of your machine. 1/3 to half of that will be either vinegar or lemon juice. It’s a lot cheaper to buy bulk vinegar than it is to buy bulk lemon juice but if you really don’t care to use vinegar then by all means pick up a big jug of lemon juice and have at it. 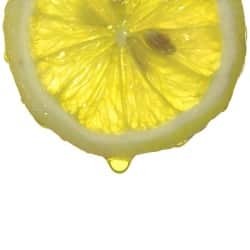 There is however one more reason why using lemon juice might not be worth it – although the acidic levels of lemon juice will help to descale your coffee maker the lemon juice won’t be that great at actually breaking up coffee oils that have accumulated inside the device over time. There are however more options for cleaning coffee makers that don’t include vinegar or lemons. You can see the list right here. Oils need to be cleaned up periodically because they go rancid and affect the taste of the coffee you make but vinegar and lemon juice alone are not as good at getting this job done. Some people turn to baking soda to get the pot cleaned but I contend that using baking soda to clean your coffee pot is not the best idea because the pot can get clogged up too easy for my taste. This is especially true if you need to descale and clean out a Keurig coffee machine. You don’t want to ruin your machine by running baking soda through the water lines. There are actually a handful of similar products on the market that are made specifically for cleaning a coffee makers water system. They breakup the hard water stains and mineral deposits and are also formulated to remove the coffee oil buildup throughout the system. If you really want to get your coffee maker as clean as possible I would look into products like De’Longhi’s EcoDeCalk which is a natural descaler for coffee machines or my personal favorite Urnex Dezcal Coffee and Espresso Machine Descaling Powder which has no smell at all and is more effective at breaking up limescale deposits and oil than vinegar or lemon juice. These products are both non-toxic and very safe and they are super inexpensive so it’s a no brainer to use them in my house. Of course use your best judgment but please do something. Those coffee pots are kind of gross if you never take the time to clean out the lines. Here are more ideas for descaling those water lines.